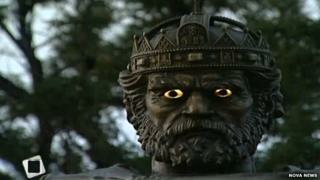 A new statue of one of Bulgaria's most famous rulers has been attracting attention for an unusual feature - its eyes glow in the dark. The statue of Tsar Samuil was unveiled by President Rosen Plevneliev on Monday in central Sofia, and by nightfall its eyes were alight for all to see. Curious locals flocked to photograph the huge figure, and it quickly became a topic of debate on social media, the Nova News website reports. Some users jumped at the chance to mock-up pictures of the tsar in sunglasses, or as Darth Vader firing lasers out of his eyes, the report says. Tsar Samuil ruled the first Bulgarian Empire in the 10th Century, conquering lands in modern-day Macedonia, Serbia, Albania and northern Greece. Sculptor Alexander Haitov says the tsar's eyes "glow with an inner light" to show that he's remembering a defeat which saw his soldiers taken prisoner and blinded on the orders of Byzantine Emperor Basil II, The Sofia Globe reports. In reality, as the paper points out, it's the work of an LED bulb, and some critics think it's all a bit too kitsch. It's unclear whether the eyes will continue to shine down on passers-by, as some reports suggest local officials aren't happy about the design. And while Bulgarians debate the tsar's monument, the government is trying to secure the return of his real bones, the Standart News site says. They currently reside in a Greek museum, and Bulgarian officials have been trying to get them back for years, so far without success.